Featuring contributions from an international team of experts, it examines the political aspects of all the world's major religions, including such crucial contemporary issues as religious fundamentalism, terrorism, the war on terror, the clash of civilisations and science and religion. Bibliographies at the end of each chapter guide the reader towards the most up-to-date references on various topics. 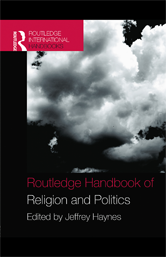 In addition, large amounts of information make this book an indispensable text for students, academics and the wider public interested in the dynamic relationship between politics and religion.